NEHA is an active, long-standing member of The Council to Improve Foodborne Outbreak Response (CIFOR). CIFOR is a multidisciplinary collaboration of national associations and local, state and federal agencies representing epidemiology programs, environmental health programs, public health laboratories, and regulatory agencies. Since 2006, CIFOR has worked together to improve methods to detect, investigate, control, and prevent foodborne disease outbreaks. The food industry is represented on the CIFOR Industry Workgroup. CIFOR identifies barriers to rapid detection and response to foodborne disease outbreaks and develops products that address these barriers. Some of the Council’s products are listred below. Visit the CIFOR website to learn more about CIFOR products, resources, and clearinghouse. Designed to aid in the implementation of the Guidelines, CIFOR created a companion CIFOR Toolkit that contains a series of worksheets and “keys to success” (model program activities). 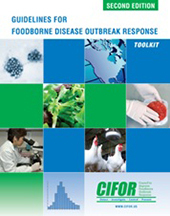 The CIFOR Toolkit helps state and local health departments understand the contents of the Guidelines, furthers their ability to conduct self-assessments of their outbreak detection and investigation procedures, and facilitates implementation of appropriate recommendations from the nine chapters in the Guidelines. The CIFOR Industry Guidelines are voluntary recommendations for owners, operators, and managers of retail food establishments (“Industry”) to clarify Industry’s role in a foodborne illness outbreak investigation. The Industry Guidelines and its tools help Industry take an active and educated role in outbreak response, thereby reducing negative economic impact to their businesses. This product was developed by the CIFOR Industry Workgroup, an ongoing public/private partnership consisting of experts from all levels of government and the food industry. The Industry Guidelines are not intended to replace pre-existing company guidelines or local, state, or federal regulations or procedures. Instead, the CIFOR Industry Guidelines are a reference document to create Industry procedures where none may exist, complement existing procedures to fill gaps and update establishment-specific procedures, and to develop specific training content for staff.